A while ago a found these old nine-patch blocks I made from my mom’s fabric scraps sometime around 1987. 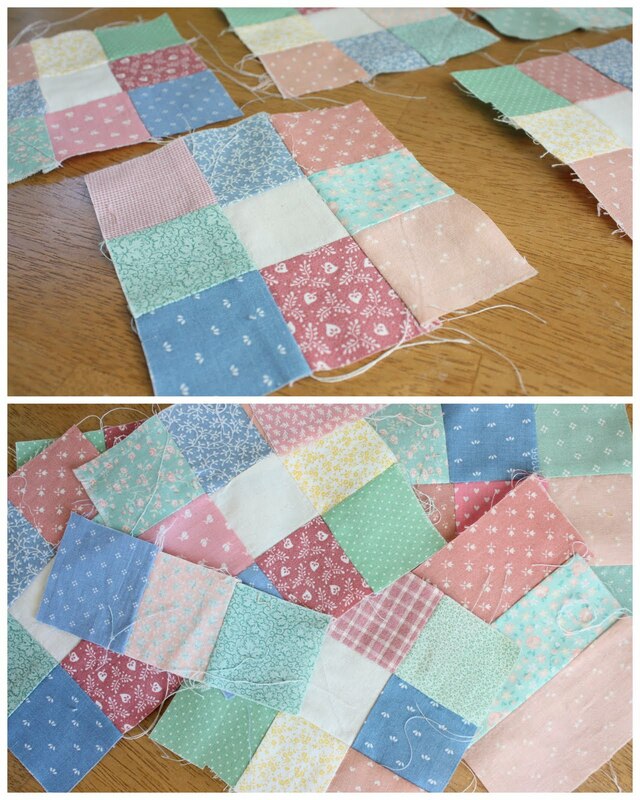 I kept them for the sentimental value – some of my first quilt blocks (they’re pretty sloppy – but that’s so charming right? Pre-“wonky”-cool. 🙂 I also kept them because they’re such a relic of the dusty color pallette that was so popular in the late 80’s. But I’m starting to wonder if those dusty colors will make a comeback sooner than I thought. (Not that I’nm looking for them – for me dusty colors evoke memories of that dorky pre-teen era of my life). But check out these images I found via Pinterest where the dusty, muted colors are evident. Succulents (those kind of rubbery plants) are so hot right now, for example. Here are a few other images from Design Seeds – a really cool site that plays with color. I won’t even pretend to be a Design/Style/Trend-setter guru, but I am fascinated by color trends (and sometimes a little bugged – it sometimes feels like a conspiracy by the design world to make us always want new stuff.) 20 years ago who would have thought that we’d all want things that were avacado green, orange, and goldenrod yellow again? I remember laughing at the orange my grandma had picked to recover her chairs in the 1970’s. Now those same orange chairs are my favorite furnishings in my house! And look at how popular the gray and pink combo is right now. I remember the outfit I carefully picked out for the first day of 4th grade was a gray and pink argyle vest with gray corduroy bermuda shorts. I thought I was hot stuff. My first quilt work is in these same colors! A couple of the fabrics look identical to mine. I think they will be back but in different combinations – I don&#39;t think the pink and blue will return together! YES~ they will come back. Home decor and color changes just like fashion. It always repeats itself…but usually with a bit of a twist to make it just a bit different.<br /><br />I have some of those very fabrics! Wow! <br /><br />So I&#39;d say that you could just finish up those squares into something lovely and then when they DO come back into vogue, you&#39;re way ahead of the game! It isn&#39;t a conspiracy! They do usher in new colors to sell things! And since everything old will be new again, I suppose dusty mauve and cornflower blue will come back too, but I don&#39;t see it happening very soon. 🙂 Those colors look exactly like our whole house in the 80s. Everything comes back, eventually. Usually with a twist. The fun part is using the old in a new way. I seriously hope not! I have left yards and yards of cheap 80&#39;s fabric at the local thrift store. That dusty blue and mauve along with all the farm animal decor was big when I was growing up but I don&#39;t think I could stomach it a second time around. <br /><br />I learned my lesson with the raqua trend…just because it is super cute and everybody is doing it doesn&#39;t mean I should. I agree that whoever sets color trends bugs me! I love color for reasons other than popularity. Its a shame we EVER have to feel a color is outdated. I have the same problem! I have a collection of blocks from my mom&#39;s stash and I can&#39;t let go of them, but I don&#39;t know what to do with them! Maybe sash them with some of that lovely, pale gray so popular now? If you come up with anything, let me know. I&#39;ll do the same! Yes – these colors will come back! I think sashing them with white or grey (or navy/dark turquoisey?) freshens them – instead of a beige calico-y print that you might have used at the time. Maybe a solid linen-color though? <br /><br />Look at those white centers! You are ahead of the game. I think anything goes. There have been several designers at my quilt guild meetings this year showing scrap quilts. One designer goes to thrift stores and buys used clothing to cut up for quilts and she has several books published. Use what you like. No one has to follow the crowd. Those are the people who usually make the new trends. So funny. The house I grew up in was completely decorated in dusty pinks and blues! I have a stack of my mother&#39;s 9-patches in the very, very similar prints and colors as yours. All hand-stitched…and not all straight. I keep thinking I&#39;ll sash them and make a top sometime. Amanda Jean at Crazy Mom Quilts did a post yesterday showing a line of fabric coming out in September (Cabbages and Roses, I think) that uses those three same colors–dusty pink, green and blue. so you may be on to something! Well, if they dont we will bring them back !!! I like modern but I also like country , perhaps modern rustic ? and those colors are gorgeous ! I am not a trend setter and barely am awake enough to be a trend watcher but I did notice at Gap that the dusty colors are coming back!! You remember those shorter, pastel plaid, preppy boys shorts? That&#39;s right, they&#39;re there… I&#39;m not a fan of those but I am a fan of the colors and use of colors you posted! That floral arrangement is beautiful! You know everything that goes around, comes around, so I imagine dusty colors will make a comeback. i had some of the dusty mauve in your blocks. i saw Barbara Walters on the view the other day and her suit had shoulderpads. EEEk! Those colors are lovely and they will come back. Even if they don&#39;t I love them anyway. I totally love how things come around again! The other day I was out with my husband (who&#39;s only known me since 2004) and I asked if he wanted to see what I looked like in the &#39;80s. I pointed out a young gal walking by in an outfit EXACTLY like one I had then. Her hair was even styled the same way. Unbelievable. 1. You MUST keep the squares. <br />2. I saw use them. Now. Who cares what is &quot;in&quot;. Maybe frame each square with a bold fabric (http://www.sisboom.com/nggallery/page-28/album-2/gallery-18/) and then have them run across the bottom of a solid color fabric front or back of the quilt. Just an idea but what ever you do, LOVE them! THey are fab! Yeah …. they&#39;ll be back. Everything old is new again. <br /><br />I just ordered myself some funky new glasses and just realized they&#39;re the same glasses I had in high school. The colors remind me of Miami Vice….. :)and yes, they will be back before we know it…. they will work, but they will always whisper &quot;the 80&#39;s&quot; that is OK… but if you piece them on point with gray.. or maybe offset by a Fasset print of flowers they can be beautiful. I&#39;ve been to design seeds before. Kind of overwhelming at all you can do. My mom laughed at me when the 70&#39;s colors started coming back and I fell head over heels for them. But now they&#39;ve grown on her, too…so I&#39;m getting the last laugh. I almost bought a couch at an auction a couple years ago that was GREEN. Not avacado green, but definitely VERY green. And I&quot;m with you – one of my favorite chairs is a goldenrod chair from the 70&#39;s. LOVE it. I agree with Debbie and Bette Lou. You will find colors and styles returning. I feel it is a true test of what is really popular and here to stay.